Fully animated 'Escaping of air from balloon' shows how molecular diffusion takes place, what appears as a solid object is in fact not so, especially if we zoom in to molecular level. The deflating of a balloon over a period of time is a result of this effect. Why it is difficult to start blowing a balloon? Why do balloons filled with helium deflate faster? Can a balloon inflate when kept for some days? Polymer chains play a big role in diffusion of air or helium out of a balloon. These are questions that are answered in detailed, there are some science projects pertaining to diffusion, common myths about balloon and questions on inflation and deflation of a balloon. 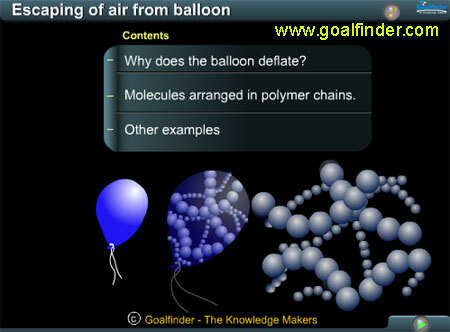 It is difficult to realize that the escaping of air from balloon is a function of diffusion, diffusion normally occurs through porous membranes but a balloon looks solid, how is it possible for diffusion to occur. A balloon is however made up of polymer chains. These chains have spaces between them to make them porous. The animation explains the process in a clear and lucid manner; it is very easy for the students to understand the process through the animation. Ans: Firstly the molecules in a balloon are under higher pressure and their concentration is higher (packed more closely together) hence the diffusion from inside to outside takes place, but by the very nature of diffusion outside to inside also takes place, but at a much slower rate hence the balloon deflates, if you were to fill the balloon with SF6 it would actually inflate.